I made him last night while I was having a Monk marathon. (You'll thank me later). Forgive the excessive number of photos.... I have a soft spot for cute doggies. Harvey didn't seem to share my enthusiasm. Can't you see how excited he is??? If you are interested in commissioning a special little felted "portrait"
of your pet or another favorite little critter, please e-mail me! I am linking this post up to "You Capture" over at I Should Be Folding Laundry. The challenge this week is "animals," so I guess my little felted guy AND the Hairy One are appropriate! 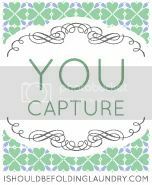 You Capture is a weekly photo challenge/linky. Check it out! I love the last picture - so cute! If we still had Daisy I would totally have you make one of her. Keep up the good work! That is so cute both Harvey and the felt dog. You are so talented. How much would you charge to make some for me? Thanks. Have a blessed day! Thanks, Carrie and Jenny.... I'll message you on FB, Jenny! Did you say "attempting"? Wow, you did a great job! You are very talented. I love your blog and I'm following. Oh, and thanks for the nice comments at Cottage Hill...I'm glad I found you! Glad I found you too, Lindy! Thanks for stopping by and for the kind words! Good idea, Carrie - I may do that. Thanks! I'm not sure which is cuter, the felted puppy or the real one! So cute! You are very talented. Holy cuteness!!!! Seriously, looks just like him! That is just adorable and you are very talented! They are both very handsome. Excellent! Oh My God. I have to have one of those little doggies. My mom has a miniature schnauzer named Hoagie and a tiny fuzzy one sitting on her desk all day would be perfect. I am e-mailing you. Oh my! How adorable - both doggies!! Beth- You mentioned on my blog that you have a schnauzer...so came over to see him! Harvey is so cute! Love the little felted schnauzer you made!